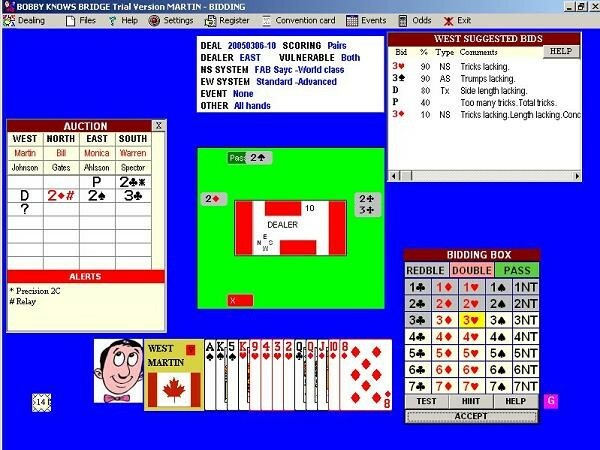 Bobby knows Bridge is the most advanced Bridge playing software ever created. You use it as a Bridge companion, that is you play with and against it. There are other programs of this type, but they all have limitations as to what systems and conventions they play, and they often make inexplicable actions. Bobby has a unique rule based method of making decisions, which makes its actions very human like and fully explainable. Bobby plays all the popular natural systems as well as numerous based on strong club openings, strong one diamond or canape principles. The user fills out either a simple ACBL type convention card or a more complete World Bridge Federation style convention card to determine which of the more than 200 conventional agreements to use, as well as the style of bidding. Please click here for an alphabetical list of conventions and systems, it is very likely the one you were asking about yesterday is explained. You can play individual hands or tournaments of all kinds in unlimited number (no buying extra anything!) for bobster points. Each hand is analyzed afterwards to show the likely result in other contracts and a match point or imp score assigned. If desired Bobby will comment on your play. Tracking your progress is also possible, since all your hands are recorded. Another unique feature is Bobby is multi-lingual, that is you set the language and all screen prompts instantly switch between English, French, German, Spanish, Italian, Swedish, Dutch, Danish, Polish and Turkish. For an explanation of how all these features work, take the guided tour help. Future additions to Bobby will include a full play analysis engine and the capability to play online with other users or against Bobby robots. Unlike the world of Chess, computers may never(!?) outplay their human opponents at bridge, but Bobby is a first step towards making them the most pleasant and reliable partners.